PVC Shutters Are Perfect For Bathroom And Kitchens. PVC Shutters are often more expensive they are also more durable and will out last any hard wood shutter. Unlike timber, vinyl shutters are resistant to moisture so can be installed in any room. They are especially suited to bathrooms and do not warp, flake or peel. Our PVC range are more hygienic as they can be cleaned with water and non abrasive house-hold detergents. While Wood Shutters are the more traditional choice, PVC shutters are quite often the more practical choice. Perfect for high moisture areas requiring more cleaning like bathrooms and kitchens. We all know shutters control light, ventilation and privacy, but there is also thermal efficiency to consider. 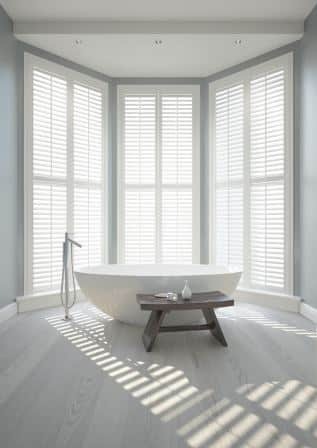 Our Shutters will help prevent your home losing heat in winter and keep the home cooler in summer and only require cleaning, no varnishing or painting is needed to keep the shutters in their best condition.